Kim Miller is an immaculately put-together woman with a great career, a loving boyfriend, and a tidy apartment on Manhattan’s Upper West Side. You would never guess that Kim grew up behind the closed doors of her family’s idyllic Long Island house, navigating between teetering stacks of aging newspapers, broken computers, and boxes upon boxes of unused junk festering in every room—the product of her father’s painful and unending struggle with hoarding. 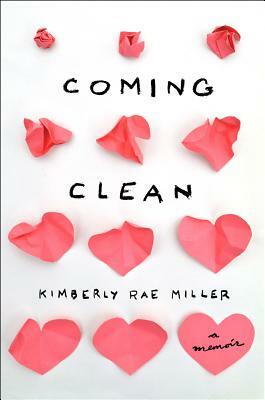 In this moving coming-of-age story, Kim brings to life her rat-infested home, her childhood consumed by concealing her father’s shameful secret from friends, and the emotional burden that ultimately led to an attempt to take her own life. And in beautiful prose, Miller sheds light on her complicated yet loving relationship with her parents that has thrived in spite of the odds. Coming Clean is a story about recognizing where we come from and the relationships that define us—and about finding peace in the homes we make for ourselves. Kimberly Rae Miller is a writer and actress living in New York City. Her writing on food, exercise, and positive body image has appeared in Condé Nast’s blog Elastic Waist, Yahoo’s Shine, Social Workout, and in Figure magazine. Additionally, Kim writes about New York living, celebrity gossip, and shopping for CBS Radio and CBS New York. In 2010, Kim was featured in Katharine Sise’s breakthrough career guide Creative Girl: The Ultimate Guide for Turning Talent and Creativity into a Real Career. She blogs at TheKimChallenge.com.